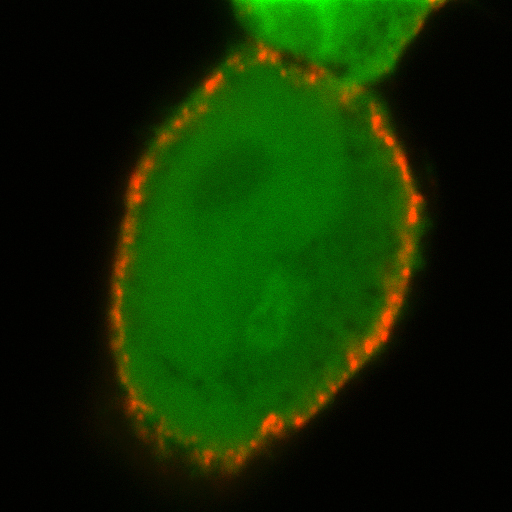 Caption: A human cell expressing both the SWELL1 (red) and green fluorescent protein. The red dots reveal the location of SWELL1 on the cell surface. Anyone who’s taken part in a water balloon fight knows what happens when you fill a balloon with too much water—it bursts. Now, consider that most of our cells are essentially water balloons: a thin membrane envelope containing a mixture that’s mostly water along with some salts, proteins, lipids, carbohydrates, and nucleic acids. Given that the average adult’s body is about 60% water, what keeps our cells from overfilling and exploding? A few years ago, Zhaozhu Qiu, a postdoctoral fellow in Ardem Patapoutian’s lab at Scripps Research Institute in La Jolla, CA, decided to dig into the molecular details of how cells are able to sense their volume and adjust their shapes accordingly. It’s long been known that, when cells are placed in low-salt solutions, water tends to flow into them, causing them to swell—sometimes to the verge of bursting. Scientists determined, about 30 years ago, that, when this occurs, channels in the cell membrane open and the cells release chloride and other molecules, such as amino acids: a process that drives out the excess water and returns cells to their normal size . However, we haven’t known the identity of the key proteins involved in this important volume-regulation response. To find out, the Scripps researchers and colleagues at The Novartis Research Foundation in San Diego screened more than 20,000 known and predicted human genes. First, they set up an assay in human cells grown in low-salt solutions in laboratory dishes to alert them when the volume-regulating channel malfunctioned. Then, they used a technique called RNA interference—in which snippets of ribonucleic acid (RNA) turn off a specific gene or reduce its activity—to inactivate each gene systematically. Out of all these genes, they discovered one that, when inhibited, prevented cells from releasing chloride ions and kept them in a swollen state . Acting on the prerogative usually afforded to those who make discoveries, they gave the protein a name: SWELL1! Interestingly, Japanese researchers discovered more than a decade ago that mutations in the same gene, which they dubbed leucine-rich repeat–containing gene 8 (LLRC8), can cause a rare form of agammaglobulinemia, an immune disorder in which patients lack antibody-producing B-cells. Their work showed that the gene was vital for the correct development of B-cells, and was expressed in the brain, heart, lung, liver, and kidney. Beyond that, very little was known about what the protein actually did. . In their latest study, the NIH-funded Scripps team provided evidence that SWELL1 is embedded in the cell membrane and is essential for the volume-regulating channel to function correctly. If SWELL1 is damaged or absent, the channel malfunctions and cells are unable restore their normal volume. Previous studies suggested that this channel is activated during brain-tissue swelling and might play a role in stroke ; and that it may also be involved in the secretion of insulin by pancreatic cells . Understanding more about this protein’s role in diseases, such as immune deficiency, stroke, and diabetes will be the next step. Role of potassium and chloride channels in volume regulation by T lymphocytes. Cahalan MD, Lewis RS. Soc Gen Physiol Ser. 1988;43:281-301. A congenital mutation of the novel gene LRRC8 causes agammaglobulinemia in humans. Sawada A, Takihara Y, Kim JY, Matsuda-Hashii Y, Tokimasa S, Fujisaki H, Kubota K, Endo H, Onodera T, Ohta H, Ozono K, Hara J. J Clin Invest. 2003 Dec;112(11):1707-13. DCPIB, a specific inhibitor of volume regulated anion channels (VRACs), reduces infarct size in MCAo and the release of glutamate in the ischemic cortical penumbra. Zhang Y, Zhang H, Feustel PJ, Kimelberg HK. Exp Neurol. 2008 Apr;210(2):514-20. Electrical activity in pancreatic islet cells: The VRAC hypothesis. Best L, Brown PD, Sener A, Malaisse WJ. Islets. 2010 Mar-Apr;2(2):59-64.